$100 Deposit is required to reserve space for each market. Full Payment is due 60 days in advance for each market. Multiple market discounts (see below) are for vendors who commit early for 2 or 3 markets. Shared tent option for $395 (split 2 ways is <$100/day/vendor) – call 312.461.9500 for details. 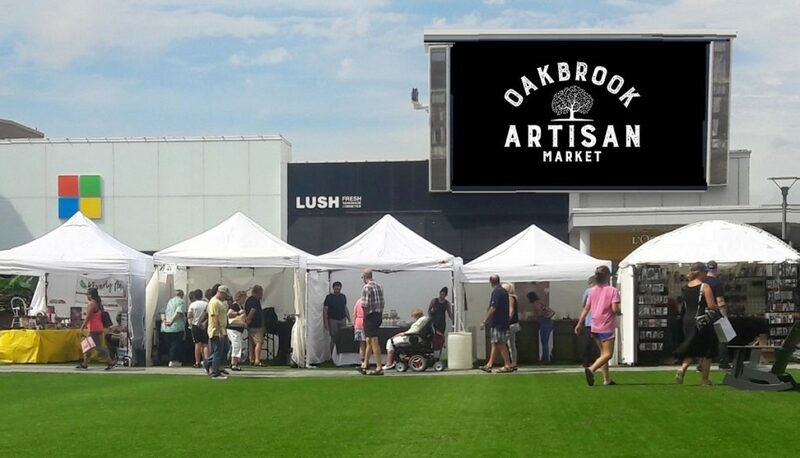 The Oak Brook Artisan Market showcases artisans in the categories of fashion, food, home goods + art. This is a two day outdoor (rain or shine) curated market. Each vendor must apply or be invited to participate. • Oak Brook, Illinois and the mall’s surrounding trade area is an affluent community (avg. HH income $106,780). • The Center is home to high-end department stores including Neiman Marcus and Nordstrom, top destination restaurants, AMC movie theatres and 168 of the world’s premier specialty stores including Tiffany, Apple, Louis Vuitton, Tesla, Crate & Barrel and Peloton. • In addition to nearby affluent communities (Oak Brook, Hinsdale, Clarendon Hills, Burr Ridge, Elmhurst, Glen Ellyn, Wheaton, LaGrange), Oakbrook Center draws traffic from an especially large trading area of ~1.3 million residents. • Oakbrook Center is conveniently located near major expressways (I-88, I-294 & I-290) and 18 miles west of downtown Chicago. Parking is free for both shoppers and vendors.